Ratha Returns with New "Courage"
Ratha, the fire-wielding leader of the Named prehistoric cat clan, has, according to the recent VOYA review of the new Ratha's Courage, "a long and venerable history". From the now-classic hardcover Ratha's Creature (Atheneum/Margaret K. McElderry/1983) to Ratha's Challenge (MKM/MacMillan/1996), Ratha's prehistoric Miocene world fascinated readers. Throughout four books, she and the Named grew and developed. In Ratha's Creature, she learned how to herd three-horn deer, discovered the truth about the supposedly witless UnNamed raiders, tamed her "creature", the Red Tongue (fire), and led a blazing revolt against Meoran, the short-sighted, tyrannical clan leader. In Clan Ground, she fought down the challenge to her leadership by the orange-eyed demagogue Shongshar, who tried to turn the Named into a fire-worshiping hegemony. In Ratha and Thistle-chaser, she struggled with the daughter she wounded and abandoned. In Ratha's Challenge, she led the Named in a mystifying encounter with True-of-voice and the Song-entranced mammoth-hunting cat tribe. Now, thirteen years later, comes Ratha's Courage: The Fifth Book of the Named. Why has there been such a long gap after Challenge and why at last did I return to the series with Courage? When Ratha sprang from the pages in 1983, she created a whirl of excitement. She captured the 1984 IRA Award, an honor "intended for newly published authors who show unusual promise in the children's and young adults' book field. Ratha's Creature also shared; the 1984 PEN USA Award and became a Locus Magazine Award nominee. She became a regular on recommended book lists for teens and was hailed as an instant classic. CBS Storybreak not only optioned the book, but made an animated episode, which aired in 1987 (and is in clips on MySpaceTV and YouTube). Here's my favorite scene, which was taken almost verbatim from the book. In it, Ratha first learns how to tame her "creature". She and the Named were on their way to recognition and popularity, like the kind accorded the present-day Warrior Cat series. Then time blew the dazzle away, like so much dust. I began to see the realities of the publishing world. Glowing reviews and awards, but low print runs. Praise by schools and libraries, but no shelf space in bookstores. British editions and paperbacks on Ratha's Creature and Clan Ground, but not on Thistle-chaser or Challenge. Invitations for author appearances and readings, but little publisher support. Finally, after 1996, the series sank out of sight in the mass grave of "Out of Print". Getting back the rights loomed as an impossible or at least a formidable process. I didn't pursue it. I mourned, tried to put Ratha behind me, even though it was hard to see old copies at used bookstores reminding me of might have been. I turned instead to my other love and vocation, electric vehicles. I became an EV journalist/editor for the Electric Auto Association, then began to build and race EVs. From 1997-2002, using electrical engineering skills acquired from my education and 12 years at IBM San Jose, I became an electric car engineer, working for small EV companies and projects, including the Alameda Station Car Project, Think Nordic (in Norway) and Corbin Motors, builders of the three-wheeled Sparrow EV. I love EVs, but these small companies can often be rough to work for. They are often minefields of egos and people who prey on the idealism of those who follow the EV dream. After an exhausting and demoralizing stint at Corbin Motors, I hung up my EV shingle. In the process I did what I never thought I'd do, namely fell in love with and later married a sweet, supportive fellow engineer named Chuck Piper and moved out to his property in the mountains near Patterson, CA. But Ratha didn't go away. She was starting to prowl the infant Internet, finding readers who hadn't forgotten her. Unknown to me, many readers had taken Ratha into their hearts and had never forgotten her. She was the subject of emails and chats between lone fans who had at long last found each other. A Ratha role-playing site sprang up, Clan Ground of the Named. Artwork based on the series appeared at sites such as The Lion King Fan Art Archive and DevArt. Although I have been Internet-savvy from the mid 1990's, I had no idea all this was going on. Perhaps I caught hints, but didn't really want to see or believe. Stubborn are those who have lost faith, especially in their own creations. Even when my then-to-be husband Chuck, told me about the Ratha role-playing site, I still thought the series was dead. Then, in 2003, came the call from Viking-Penguin/Firebird editor Sharyn November. Actually the call came to my hubby at work, saying that the editor of the acclaimed Firebird Books line wanted to contact me. Then came a series of getting-to-know-you emails. Sharyn interacts with teen readers through the Internet, taking their recommendations for out of print fantasy books, and re-issuing them in her Firebird line. Her young advisors had suggested my Ratha series. Would I be interested in writing a new Ratha? If I did, the new title would pull the series back into print. Stunned with joy and disbelief, I took a day or so to think about it. In the crevices of my brain, Ratha stirred, awakening after a 13-year sleep. After years away from the series, could I do another book? Did I have the same feel for the Named? Could I still work the magic that put readers into the body and behind the eyes of a prehistoric big cat? If I could, would this be an instant rewind to the promise of 1983, but this time a real success? Visions of celebrity, riches, acclaim, loomed again before my eyes...this time the promise could be made real. What if Ratha, driven by her growing idealism, did everything she thought was right and then had it backfire on her? How would she react, recover, and cope with the resulting disaster? Muttering a bit about being put through the wringer (once again! ), the big kitty agreed that I had found the backbone on which to build Courage. Between bouts of scribbling, I began researching recent big cat paleontology. Courage was to be based, even more strongly than Creature, on up-to-date knowledge of fossil big cats. Alan Turner and Mauricio Anton's wonderful "The Big Cats and Their Fossil Relatives" became my bible. There were indeed many changes in paleontological research since the mid 1980s. The leopard-like paleofelid Nimravus, on which the Named were originally based, had been thrown out of the Felidae on the basis of differences in inner ear morphology. Nimravus became the titular head of its own family, the Nimravidae. Horrors! Ratha was, according to the scientists, no longer a true cat. Yarrr! I also realized that during their trail through the wilderness of print, the Named themselves had begun to morph into a more cheetah-like form. This was definitely due to Tomorrow's Sphinx, my stand-alone novel about cheetahs, ancient Egypt and King Tut. Sphinx's cover art influenced the jackets of Thistle-chaser and Challenge. On Challenge, Ratha looked like a blend of puma and cheetah. I hadn't planned this, but what the hell, I love cheetahs. I think this affection crept into the saga, as the Named, particularly Thakur, the slender, swift herding teacher, already had many cheetah characteristics and behavior. The Named lifestyle of herding three-horned deer demanded a cat who was fast as well as strong. I learned about Miracinonyx, the American fossil cheetah-like cat who may have been the ancestor of today's mountain lions. But I had already established that the Named world is the Early Miocene of 20-25 million years ago. Miracinynonyx came 10 million years too late, in the Pliocene. Then, in the pages of "Big Cats" I found Dinaelurus crassus, a sister species to Nimravus. There wasn't much known about this nimravid, but certain characteristics of the skull (enlarged nasal passages and shortened face as compared to the leopard-like Nimravus) fueled speculation that this animal may have been "a cheetah-like cursorial predator". A "cheetah" before there were cheetahs. Dinaelurus crassus became my new armature on which to re-build the Named. And build them, I literally did. "Big Cats" artist Mauricio Anton, when he learned about my project, kindly sent me drawings from the original Eaton (1926) paper about the fossil. From those drawings, I built a 3-D model of the fossil skull, with the idea that I could generate my fictional species from D. crassus. A second clay model skull featured an expanded braincase to house the human-equivalent intelligence of the Named, and I now had the skull of Dinaelurus illumina sapiens, Ratha herself. Photographing each step of the process, I did a facial reconstruction, using Anton's "Big Cats" illustrations as a guide. I began with the second clay skull, added deep muscles, eyes, overlying muscles, tendons, veins, and finally skin and a slight suggestion of fur. Having photographed the bare clay bust, I then used Photoshop to add color and fur texture. The completed head needed a body. Existing fossils of Dinaelurus crassis have only the skull and neck vertebrae, so I would have to make an educated guess. Using drawings of cheetah and puma skeletons, I put my character together on paper. For a speedy cat with good jumping abilities and the strength to pull down prey, I used a stretched version of the puma skeleton and gave it the rear legs of the cheetah. Once I had the skeleton, I could sketch in muscles and skin. Another tool to visualize the Named was 3-D animation, done with Anim8tor. I had great fun putting together a Ratha model, which I could then animate. Using photos of lions, cougars and cheetahs galloping, I did a run cycle. First I had her galloping in place, then crossing the screen, then bounding in from the background in a feline grand jete'. I settled into a steady schedule; the morning and early afternoon were for writing and story development; the late afternoon for chores, exercise and art/animation. Early in the novel's development came a crucial question; should I continue the story of True-of-Voice and the Song-hearing(collectively dreaming group-think) face-tail hunters from Ratha's Challenge? Some readers thought that plot line; wandered too far away from the spirit of the series; others thought it enhanced the saga and wanted to know more about True-of-voice and his people. I decided that the face-tail hunters had to be in Courage, but I would focus on the effects they had on the Named and not stray off too far into the mysticism of the Song. Courage could also help answer another question often asked by readers. What happened to Thistle-chaser's brothers, the other cubs in Ratha's litter by Bonechewer? It was time to return one to the stage. But he had to be unusual in some respects, not just a male version of Thistle, or a re-run of Bonechewer. When I was researching mutant and hybrid big cats on the net, I ran into a description of a cobweb panther, (there is also a photo here) which is a black leopard with white markings so faint that the cat appears draped with spiderwebs. The white also tends to appear and disappear in the fur as the animal moves. Voila! I had the idea for Night-who-eats-stars. The various threads began to weave themselves together. Ratha needed an interesting disaster in order to test her mettle. Who would cause the disaster? True-of-voice's people. Why would it happen? Because Ratha, in following her best intentions, set off a cascade of events that killed many of the face-tail hunters. What was the agent of that catastrophe? The Red Tongue, Ratha's own creature. Then came another idea. I didn't want True-of-voice's people to attack the Named because they were angry about the deaths. They are not conscious in the way that the Named are, and would not react in that way. I wanted a more "biologically-based" reason. Suppose the face-tail hunters who died were all females? 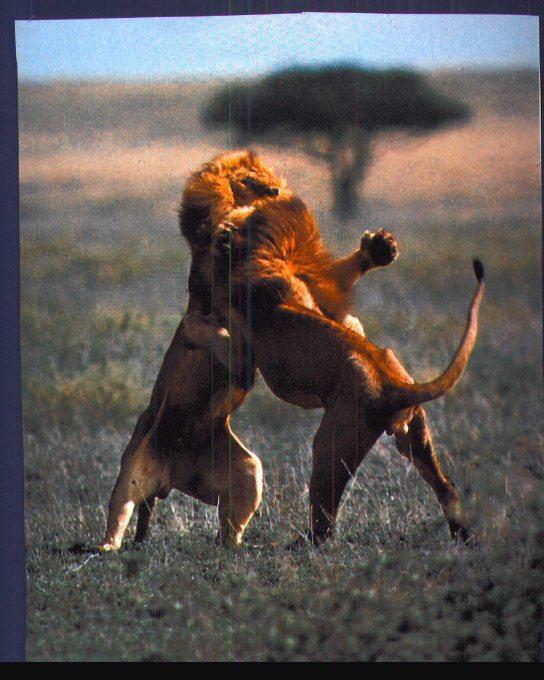 An imbalance in the number of males to females among lions causes fighting over who gets to mate, and often the exile of younger and/or weaker males. Suppose a group of younger males split off from True-of-voice's group with their own leader. Where would they get mates? By capturing Named females, including Ratha herself. For one of the climax scenes, I used a cheetah behavior, namely the "courting circle" where a female is courted by a group of males. I enlarged and intensified it to include more than one female and a large group of males. Ratha, her daughter Thistle-chaser and her friends Bira, Fessran and others prowled uneasily in the midst of a crowd of yowling eager males. Tense, exciting, unusual, dangerous! It worked. The story, not the writer, assigned the characters essential roles. Ratha would follow her altruism by sharing fire with the face-tail hunters, setting up a situation that made it easy for the renegade Night-who-eats-stars to steal some coals and accidentally ignite the blaze that kills the face-tail-hunting females. Thakur would counsel caution and later help Ratha cope with the results of her mistake. Bira would ask for kindness toward the other tribe; Thistle would push her mother to look beyond the needs of the clan. Cherfan would handle the heavy and dirty jobs, fight like a lion, but show an unexpected flair for nursing orphaned cubs, while young Mondir would jump at any excuse to show off his newly-gained strength in a tussle with an enemy. Fessran would be—well, Fessran, but a fiercely loyal friend to Ratha, offering to take on the worst tasks so that Ratha would not have to suffer them. A lighter element came in with Mishanti (from Ratha and Thistle-chaser) and Bundi (from Clan Ground). Their adventures with their huge tamed "rumblers" (Indricoptheres) Grunt and Belch not only created a scene that showcased the irascible Fessran, they also unexpectedly provided the Named (and the author) with an unusual way of resolving the book's climax. The young male Ashon, based in coloration on my silver-gray (perhaps) part-Korat kitty, Athena, joined the ranks of the male clan herders. Drani, the nursery helper from Clan Ground, leaped in to defend the Named cubs when the face-tail hunter males attacked the nursery. Quiet Hunter, Thistle's face-tail hunter mate from Ratha's Challenge, would be an intriguing link to his former tribe through his sensitivity to the Song. The book grew, sent some characters hurtling in unexpected directions, made loops, twists and turns before the dust settled on the words "The End." A thorough edit, copyedit, then onto multiple CDs for backup, then away over the Internet to Richard Curtis and thence to Sharyn November. Then, on 6/22/07 came the email letter that struck me numb. Viking-Penguin had re-thought the whole thing. They weren't that happy about the sales of the first two books. Even though Amazon had re-stocked several times and the chain bookstores were carrying Creature and Clan, it wasn't enough. Apparently they expected a monster seller that could squash Harry Potter #7, and didn't get it. So V-P decided that they were never going to sell more than 2100 copies of the new hardcover, therefore they weren't going to make any money, therefore they were going to cancel the book. Cancellation agreement to follow, nice doing business, but you were a disappointment. We'll just move on to the next potential Hunter or Rowling. I am sure that the decision came from the higher-ups in Viking-Penguin, and that Sharyn herself tried to fight it. She believed in the series; they didn't. Not that it mattered that they asked me to write the book in the first place, and I spent more than a year of my life doing it. And that I completed my obligations as stated in the contract, supplying copies of the old books, writing the new one and turning it in on time, even going far out of my way to be helpful. None of that, apparently, mattered. Nor did it seem to matter that readers and reviewers who got one of the few advanced readers copies of Courage raved about it. Richard Curtis and I fought like rabid cougars, using everything we could think of, including a letter that had quotes from the emails I had received from fans eager for the book. Nothing worked. Then, more discouraging news from V-P. Oh by the way, we're thinking of canceling Thistle-chaser and Challenge as well. Us rabid cougars redoubled our efforts and some Ratha fans offered to pelt Viking-Penguin with protest letters. In the end, it was a compromise. We saved Thistle and Challenge, but we lost Courage. The next two books came out in the Fall of 2007, appeared in bookstores and on Amazon. Fans on Library Thing and Goodreads rated them between 4-5 stars, as they had the first two. Though I was desolate over Courage, I had gotten the series back into print. It was Richard Curtis who told me about Greg Bear's experience with his new novel Quantico; His US publisher unexpectedly rejected it. Curtis suggested an alternative, the infant, but lustily growing e-book market. Greg agreed, Quantico came out as an E-Reads, did well, and went into physical publication. Quantico deserved to succeed; I bought a hardcover copy, read the book, and thought it was excellent. Could Courage take the same path as Quantico did? I thought for a while, exchanged an email with Greg Bear, who encouraged me to try, and decided, what the heck, why not. I owed it to Ratha fans to get the book out. The road to e-publication was a bit bumpy, but new ways often are. First, Courage was scheduled to appear as an E-Reads release on Fictionwise.com. Then, when E-Reads allied with Baen Books, they decided to make Courage a featured e-release for April. So here we stand, with the series back in "deadtree" print and the new book ready to jump out on the Internet. I have learned a lot about Internet book promotion in the process. I have tried my best not only to get the book out on the Internet, but to interact with fans via email and posts on many websites, including MySpace, LiveJournal, LibraryThing, Goodreads, Facebook, Wands and Worlds, Baen's Bar, You-Tube, and others as user "rathacat". The character visualization 3-D animations still appear on You-Tube, along with clips from the animated Storybreak Ratha's Creature episode (also on MySpace). The author and series have a Wikipedia entry and comes up on search engines and query sites, such as Ask.com. There is a new role-playing site (Into The Mist; Voyage Untold) and a fan site (Trails of Conquest>). The Scratching Log, hosted by Blogger, is syndicated to various sites, including the Amazon Connect facility. Courage itself has captured a five-star review on the Internet. Not too shabby for a book that got canceled. Wands and Worlds' review of Ratha's Creature also has some good words about Ratha's Courage plus a link to the book's page on Baen Webscriptions. Later this spring, Amazon.com will carry Courage as an E-book (right now the page says not available, but it will be) and it will appear on Fictionwise.com. In some ways, Ratha's Courage resembles the series character Thistle-chaser, Ratha's daughter, who was nearly killed in infancy. Like Thistle, the new book has survived, shaken off its injuries and is thriving in the hearts of its devoted fans. Thanks to everyone who made this possible, live long and enjoy. Imaginator Press released Ratha's Courage as a trade paperback on October 5 2008. The book became available from many internet booksellers and drew numerous positive reviews online. Courage was in the top nomination for the anthropomorphic community's Ursa Major Award, and listed in the ForWord Magazine's awardselections. To publicize Ratha's Courage, I attended Further Confusion 2009 (late January) in San Jose as a Guest of Honor. This was my first furry (anthropomorphic) and I had an absolute blast doing panels and conferences. I even did some fursuiting myself. I plan to attend Further Confusion 2010 and look forward to participating again. I continued to post on Twitter, got listed on Cats Who Twitter, as "Rathacat", was invited to virtual "animal pal" beach parties and roadtrips, and someone even made Ratha a virtual surfboard! I also did several author interviews via telephone, and will be making the audio files available on this new site. Because Viking-Penguin was converting most of their books to the Amazon Kindle format and dropping the paperbacks, Clan Ground, Thistle-chaser, and Challenge went OP in mid 2009. The books are still available as Kindle editions and Ratha's Creature is still in paperback as well as on Kindle. Sheila, I, and agent Richard Curtis acted as quickly as we could to request reversion of the rights to the other titles. We also secured as many of the books as possible, to keep them available to fans. The good news is that Imaginator has bought the rights to Clan, Thistle, and Challenge, and plans to re-issue them as paperbacks. If V-P lets Ratha's Creature paperback go OP, Sheila and I will take the rights on that one as well. Having control of the whole series will make marketing it much easier and more successful. We wanted to use the striking Christian Alzmann covers that appeared on the Firebird editions, however we couldn't get a timely response from V-P. We have found a new and exceptionally talented artist and are starting to arrange things with him. The experimental Twitter fiction "Ratha's Island", a Tweeted novelette-length piece featuring our favorite big kitty and a cast of very strange animals from a different line of evolution began on March 14, 2009 and ran every day twice a day for a month. It also helped to attract new readers to the series. So, once again, Ratha and the Named stand poised on the brink of a wonderful new development and I am very excited. I'll keep everyone posted.